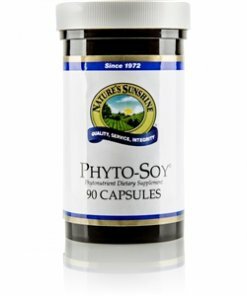 Nature’s Sunshine Phyto-Soy® blends the nutritional benefits of soy into a formula that contains more isoflavonoids than tofu, tempeh, and roasted soybeans. This non-GMA formula supports the immune system, glandular function, and circulatory health. 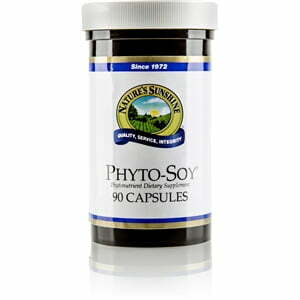 One Phyto-Soy capsule contains 120 mg of soy bean extract standardized to 10% isoflavonoids. Instructions: Take one capsule with a meal three times daily. Drink one glass (8 oz) of Nature’s Spring water with each capsule. Three capsules daily supply 36 mg of isoflavones (genistein, daidzein, glycitein). Cellulose (plant fiber), silicon dioxide (powdered silica), magnesium stearate (vegetable), gelatin, and water.